PLOT Forty years after his baby-sitter killing spree, Michael Myers returns for the one who got away. BOTTOM LINE A solid addition to the deathless horror franchise. 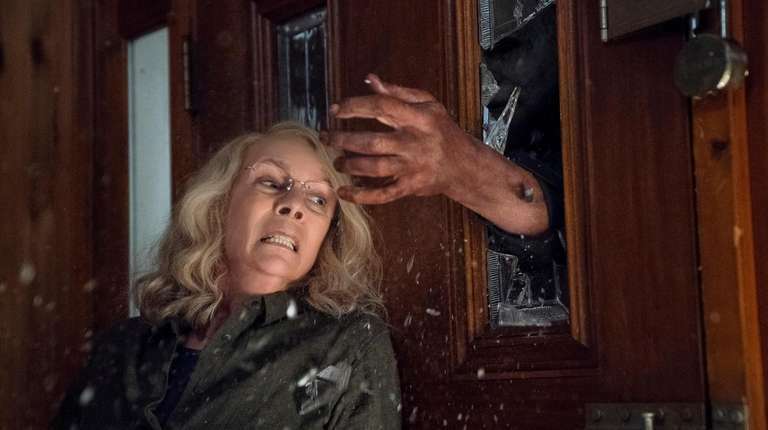 After some 40 years of sending half-naked girls to their deaths at the hands of an emotionless male psychopath, the “Halloween” franchise finally turns the tables. In David Gordon Green’s “Halloween,” which shares its title with John Carpenter’s genre-defining original from 1978, the hulking figure of Michael Myers — he of the face-mask, jumpsuit and chef’s knife — returns to his old hunting ground of Haddonfield, Illinois, but becomes almost as much predator as prey. In a symbolic twist, his foe is the familiar face of Jamie Lee Curtis, reprising her role as Laurie Strode, the baby-sitter he failed to kill the first time around. “Halloween” is a horror film that tries to meet the new feminist moment and — although written and directed by men — mostly succeeds. Its strength is Curtis’ Laurie, no longer a quavering teenager but a grizzled trauma survivor. Now a gray-haired recluse living in a weed-choked compound, Laurie isn’t the aging hippie she might appear to be but a doomsday prepper stocked with supplies and munitions. Her daughter, Karen (Judy Greer), long ago shut her out and now keeps her own daughter, Allyson (Andi Matichak), away from Laurie’s "boogeyman" ravings. Technically, Laurie died in “Halloween: Resurrection," but so what? (This film ignores most of the franchise.) The new Laurie is a great twist on an old archetype, and credit goes not only to Green and co-writers Jeff Fradley and Danny McBride but to Curtis, who brings a sinewy physicality and a flinty intelligence to her former scream-queen role. “Halloween” gets off to a slow start as it explains Laurie’s past and sets Michael (James Jude Courtney) up to escape from his imprisonment. Once he does, the movie becomes a reasonably effective slasher film, with Michael going from house to house and teen to teen. Still, “effective” isn’t what we want from a long-gestating showdown between two horror-movie icons. The slow-burn buildups go too quick, and the bloodshed feels brutal but routine: knives into throats, boots into brains, etc. And when Laurie and Michael finally meet again, we get a few clever twists but not the emotional catharsis we expected. “Halloween” could have truly exploded some of its own myths; instead, it's content to keep the franchise alive. LOVE LETTERS (1984) Curtis plays Anna, a woman who goes into an adulterous affair with her eyes open. Amy Holden Jones’ forgotten indie drama, a critical smash at the time, is well worth tracking down. A FISH CALLED WANDA (1988) This Pythonesque crime-comedy, starring John Cleese and Michael Palin, cast Curtis as a quick-witted con-artist. The film was a major hit and retains a 93 percent rating on RottenTomatoes. BLUE STEEL (1990) In this early effort from director Kathryn Bigelow (“The Hurt Locker”), Curtis stars as a cop framed for killing an unarmed man — an unusual role for a woman at the time. The film received lukewarm reviews and fizzled at the box-office.